Just over a year after their debut, Finnish newcomers Amberian Dawn are at it again, album number two and seeking to take over the world with their brand of operatic melody. They still sound like Tarja-era Nightwish, but there’s been a definite improvement – not only have the musicians involved tightened up considerably, but the songs on The Clouds Of Northland Thunder have had a good deal of thought put into them, resulting in an album that doesn’t quite all sound the same and takes as much from Rhapsody (Of Fire) as it does Nightwish. Clearly, a bit more money has been spent on making this album sound good than the first time around, and the keyboards of Tuomas Seppälä sound great. Of course, the positive elements of their debut are still here; the guitarists (Kasperi Heikkinen and Emil "Emppu" Pohjalainen) play their hearts out with widdly solos aplenty. Vocalist Heidi Parviainen is still very impressive, taking a high note from the start and proving that her operatic training was money well spent. It’s a curse as well as a blessing, as she rarely changes her style and whilst we get some male vocals on the enjoyable Incubus, it’s not really enough, as a bit more variety would have improved the experience to no end. Still, the songwriting is of a high enough quality to overcome this, the frequent instrumental sections all well-thought-out and some even approaching that cherished Proggy standard – the sudden shift in tone of Shallow Waters, for one. Opener He Sleeps In A Grove sets the pace well and is pleasantly catchy with a rather kickass solo, whilst Lost Soul expertly mixes riffs and melody. The Clouds Of Northland Thunder ultimately never steps far from the band’s base, unoriginal sound, however, and there’s no epic-length song for them to show off; all the songs present are between three and five minutes long, and it’s hard not to wish that they’d sacrificed a couple of the weaker songs from the twelve-strong tracklisting in favour of a ten-minute finale. Still, towards the end of the album it gets ever so slightly more pensive in tone, the thoughtful Morning Star and the balladic closer Birth Of The Harp subtly changing the atmosphere and helping to give the album a bit of character. If Amberian Dawn keep up the speed they’ll have a new, even better album out this time next year, which I’m actually looking forwards to! It seems I was correct in my review of Rivers Of Tuoni in calling the band a born support act, as Amberian Dawn were recently the main support on Epica’s European tour, as well as playing with Kamelot and Evergrey. 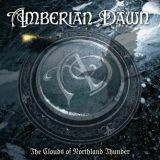 They might not be as big or slick as those bands yet, but Amberian Dawn have successfully fulfilled expectations, making an album that even a relative genre novice like I can enjoy and are well on the way to becoming a band that fans of the style should take serious note of. Bravo!